In the days before internet, my mother was an avid collector of cookbooks. You could build a fort out of the stacks of Canadian Living magazines we kept in our basement. But I specifically remember being fascinated by this one aggressively '90s cookbook called, "The Magic of Jell-o"
I would open the book to the polar bear-themed igloo cake (that, as an adult, I now realize is strikingly complicated for the "kids treat" section) and stare at it, trying to will it into existence before me. 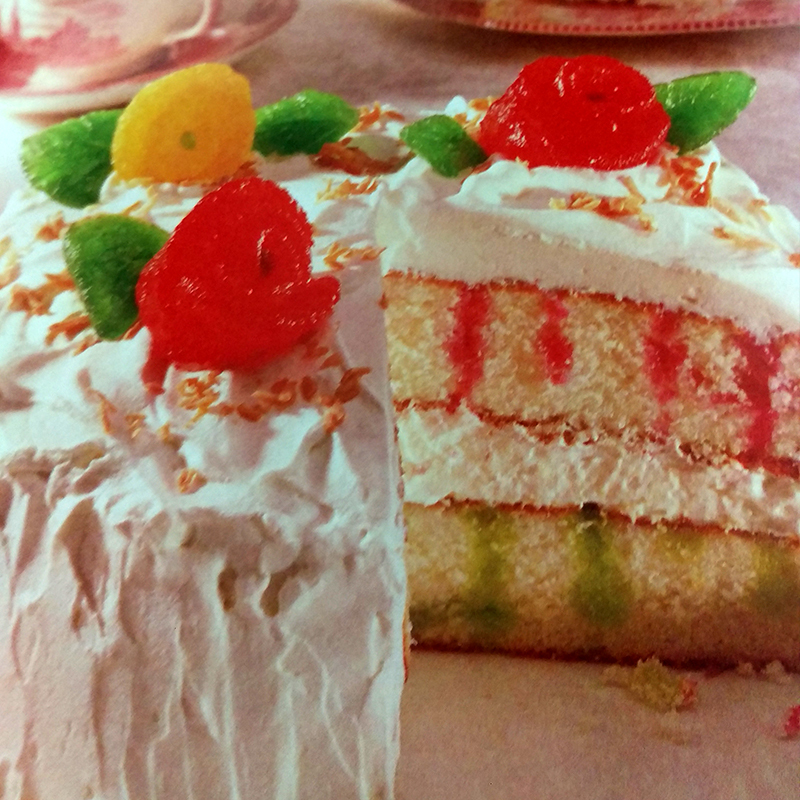 We never got to try that cake, but some of the easier recipes do stand out from my childhood. Mixing cookie crumbs or chocolate chips into instant pudding, or making Jello powder-coated marshmallows — called "Squisharoos" in the book. Recently, my mother unearthed this ancient artifact of yesteryear and – like every Boomer offloading their clutter to their kids – gave it to me. I've been excited to make something from this magical book of my childhood as an adult, and I finally got the time to do it. I wanted to choose one of the more involved recipes (ya know, to make it worth the mess). I don't have an electric mixer, so that limited a few of my choices. Looking around, I had almost everything I needed to make the Peanut Butter and Grape Jello Pie recipe – although I would have to buy Cool Whip for the first time in my life. Did you know they sell it frozen, and no where near the dairy section? Well, I did not. I also substituted Raspberry for Grape since that's what I had on hand, and because everyone knows that everything Grape-flavored just tastes like medicine. It looked a bit wobbly when I left it to set in the fridge overnight, but it came out looking nearly picture perfect. The peanut butter base is actually pretty delicious and I like how the pink mousse topping looks exactly like unicorn vomit. It tastes a bit like a sugar-coated PB&J sandwich... in a good way. And since most the recipes in the book are based on these few simple twists to the regular Jello making process, I'm definitely going to push the boundaries of how far I can take these Jello experiments. If you like the way this looks, its ridiculously easy to make. STIR milk gradually into peanut butter in medium bowl until smooth. Add pudding mix. Beat with whisk until smooth. Gently stir in 1 cup of whipped topping. SPOON mixture into crust. Refrigerate. DISSOLVE jelly powder in boiling water. Add ice cubes until slightly thickened (about 3 - 5 minutes). Whisk in remaining whipped topping. Chill until slightly thickened (about 30 minutes). SPOON jelly mixture over peanut butter mixture. Refrigerate overnight. I know many Milwaukee friends of mine would challenge this. There are two notorious killers from Milwaukee and more to be said of the serial killers from elsewhere in Wisconsin, which does make the state a touch on the murdery side. But this pales in comparison to the small Ontario town between 1959 and 1984. During that time, London had a population of 200,000 people and as many as SIX serial killers, more per capita than everywhere else on the planet. They had nicknames such as the Mad Slasher, Chambermaid Slayer, and Balcony Killer. More than 30 people were victims of serial killings during those 25 years, and some of the murderers were never caught. And now I live in Chicago — home of America's first serial killer, H.H. Holmes, during the 1893 World's Fair — and as Devil in the White City readers will know, who also had a Toronto connection. Maybe it's just the time of year, but this has got me feeling quite spOoOoOky! I had my share of childhood classes: ballet, jazz, vocal lessons, tap dancing, gymnastics and theater camp. I tried out for the high-school play, but ended up spending most of my time behind the curtain making sets, designing props, and directing lighting as a stage manager. Forgetting all about the stage in college, I went on to grow-up into a creative adult and eventually became an art director. Then in 2015 I had the most fun I've ever had with my pants on at Comedy Sportz in Milwaukee. After moving to Chicago, I continued taking classes at the iO Theater and can't wait to move into Level 3 this March. I love improv because it has so much to offer to the creative process. As an art director and a Type-A person, I am used to being prepared. But in improv it is impossible to be prepared. There are no rules and the only way to survive is to be in the moment and trust your stage partners have your back. There's no curtain in improv. You're already on stage and the lights are on. The audience gives you a suggestion. No time to think, just say the first thing that comes into your head. I've found this tactic most helpful in a brainstorming session when we have 8 concepts and are reaching for those last few nuggets of gold in the backs of our brains. Sometimes just saying the dumbest thing out loud can move it out of the way and gives my brain room for a great idea. Often I've found the silliest thing I blurted out in a brainstorm session inspires the truest insight. On stage, you have to listen (and watch) your partner to keep the reality alive. If they establish it is night time in our scene, I'll break out my pretend flashlight and jump at every little sound. I find myself using this skill often when presenting. The group will often give visual cues while I present and by actively paying attention, I can adjust the presentation to suit the audience. By assessing comprehension, I can slow down my presentation at critical moments, or choose breeze through that boring section on the migration habits of African and European swallows. There are no mistakes, because even mistakes can become part of the scene and often enhance it. If it's established we are on a boat and I forget and walk off the edge, I haven't made a mistake, I've just uncovered my superpower! This is just great advice for life in general. At it's core, it's optimistic; Every cloud has a silver lining and every challenge is an opportunity. Keeping this attitude while working with challenging clients opens up windows when they close doors. When budgets get cut and ads get smaller, keeping a positive attitude can help you realize it works better as an out of home than it ever did as a :30 spot, anyway. Improv helps me improve the way I connect to creative partners, clients, and ideas. It is good to practice thinking on my feet and being on stage gets me comfortable with being uncomfortable. I still love to make meticulous to-do lists, but when the client throws the plans out the window, I'm ready to wing it and still soar.